First things first – we had to get rid of the 50 shades of brown! The majority of the walls were repainted a light gray but we chose to do one full wall and the window bump-out in chalkboard paint. The chalkboard wall is fun for notes and drawings but when it’s blank I really like the texture it creates on the wall (although I admit that I also loved the inky black before we chalk primed it!). In our small entryway we decided to go for a shot of color (which is proving to be *so* difficult to photograph properly!). Tudors Down alerted me to free quarts of paint from Clark & Kensington at Ace Hardware and we happily picked up a quart of Emerald Ice. The coverage was nice but since we’ve gotten used to using low or no VOC paints we found the “regular” paint smell overwhelming. Last spring we had our floors refinished and stained a dark walnut. Old 2 Gold floor refinishing in Grand Rapids did an amazing job and we are so happy with how they turned out! 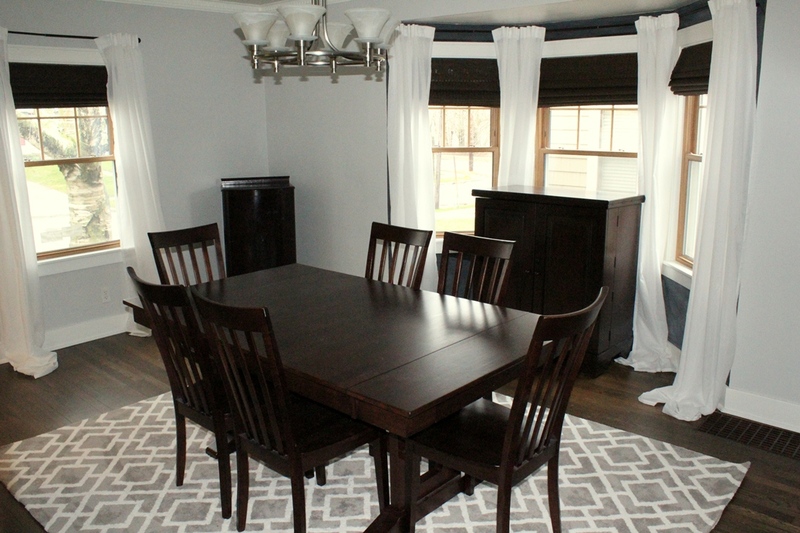 But it left us with dark wood furniture on top of dark hardwood floors, fading the table into the background. When I saw this rug on Joss & Main about a month ago I decided it would be the perfect solution. I loved the graphic pattern and neutral palette. And even though Mr. Lemon was traveling, I pinned him down to agree ;) Plus, the price was about half off the link above! A seriously great price for a 8’x10′ rug. I was slightly terrified of ordering sight unseen with a no return policy but I searched online for reviews and everything looked good so we just went for it. And we definitely were not disappointed! 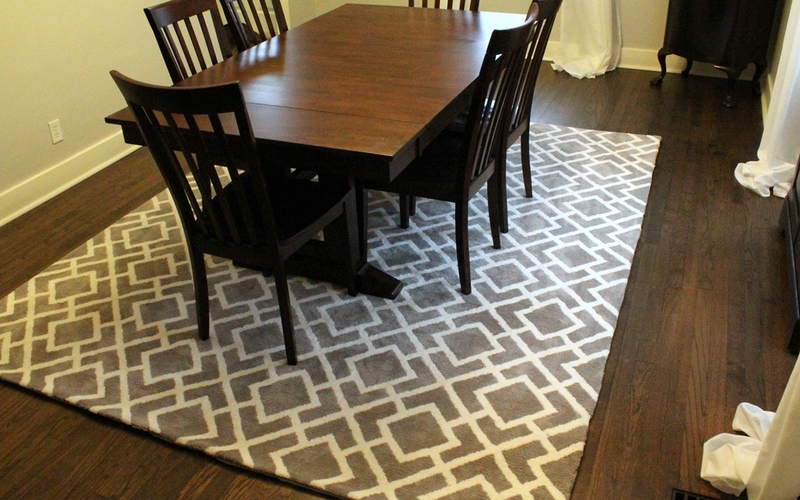 The rug is a medium pile, ridiculously soft and now the table really stands out. 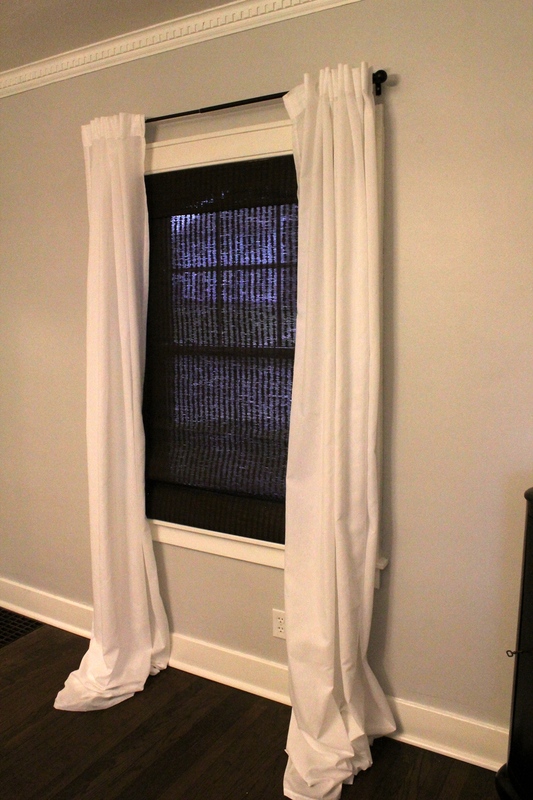 For the windows, we decided to go with a layered shade + curtain look. 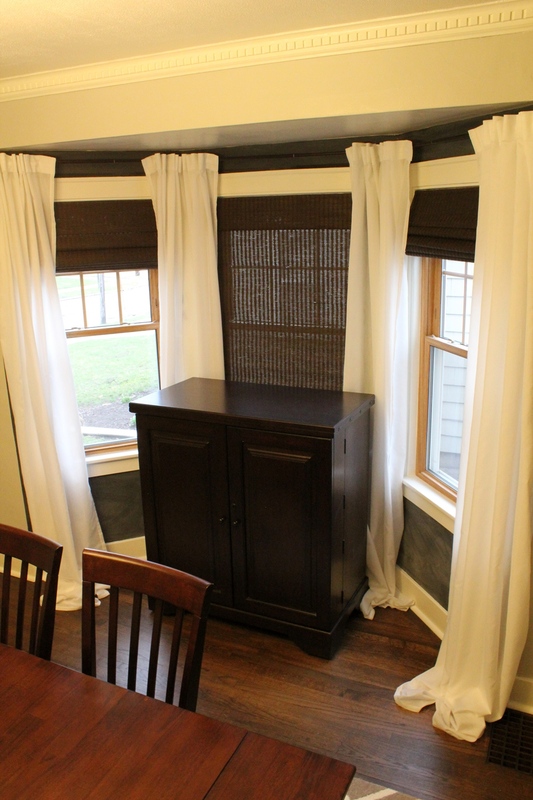 I originally looked for matchstick roll up shades but couldn’t find any in a dark brown stain that I liked. We ended up with a textured fabric shade that gives a similar look. 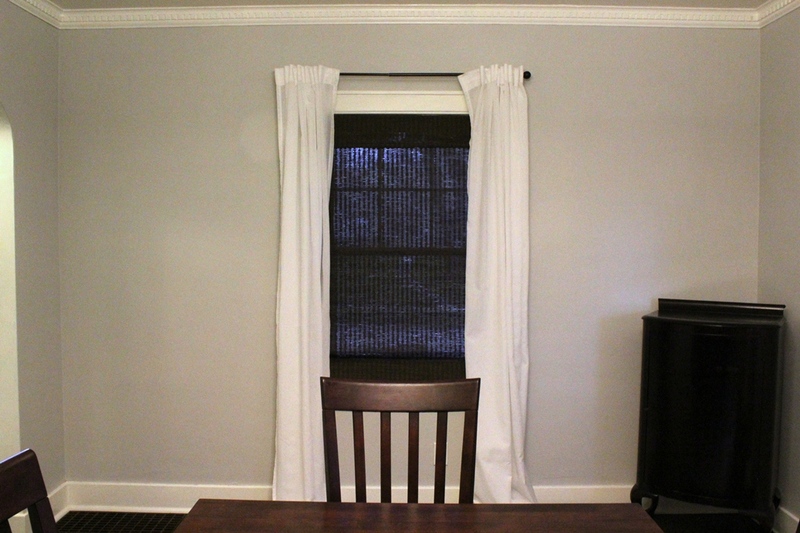 Over that we layered the ubiquitous Ikea Vivan curtains in white. You seriously can’t beat these for the price! Don’t judge me for not hemming them quite yet! Our previous curtain rods were a bit too ornate for our tastes so we replaced them with simple rods that disappear into the background. We are really loving how things are coming together! I’ll be showing how we hung the DIY Map Art next week – I had to make sure everything stayed put before sharing our unorthodox hanging method! After that, the next step I’d like to tackle is artwork on this very empty wall! LOVE the new rug! Nice progress! Thank you! We are SO happy with it! This is a gorgeous dining room! I also love the rug! Hello darling, your progress is lovely! Those curtains are delicious! You will have to find a big statement piece chandelier to be the crowning jewel for your room! Thank you! And yes, I’m definitely searching for the perfect statement chandelier! wow, this is a huge change from the beginning!! it looks amazing! I love the rug too!!! Dropped by from YHL. The room looks great! Love the rug. 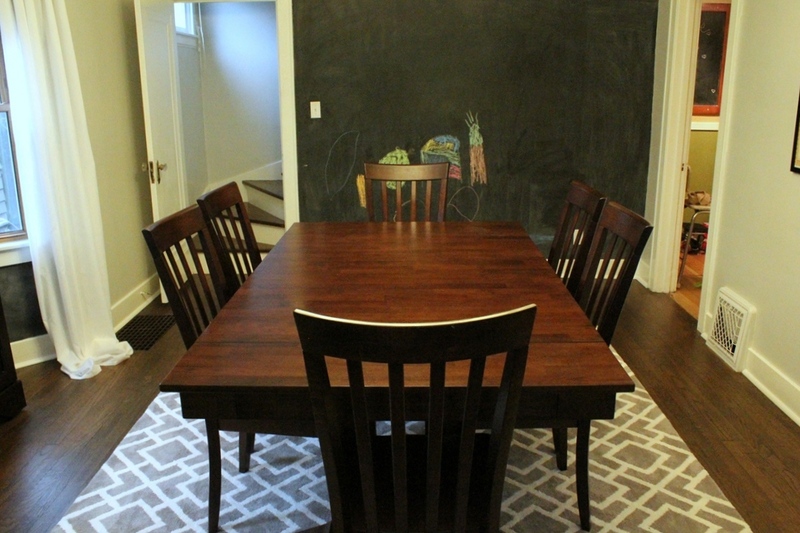 I have a question about your chalkboard wall: Do you get a lot of chalk dust all over your floors? I like this idea, but we have dark floors and it seems like EVERY speck of dirt shows up on them. There is a bit of chalk dust, but it’s so fine that it definitely doesn’t show up the way “normal” dirt does. And I do understand about the dark floors – I love our dark finish, but I’m definitely more motivated to keep things neat! One more question! :) What kind of crown molding is that? Really cool! 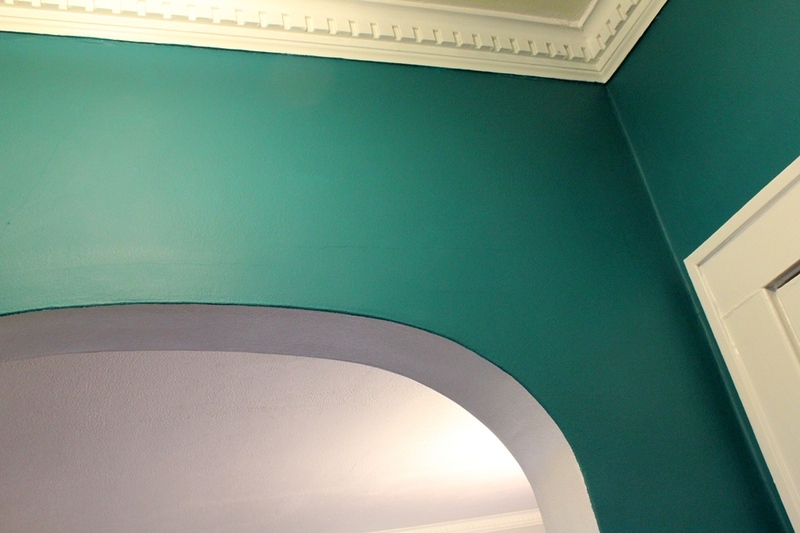 It’s called dentil moulding – we believe it’s original to the house :) We absolutely love it!